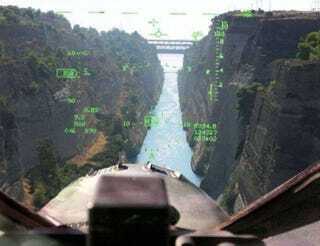 A view through the front windscreen and HUD of a Hellenic AF F-4E as it transitions down a very tight canyon with a pretty serious obstacle ahead! If you look at the HUD it shows that the Phantom doing 358kts and according to the flight path indicator (little circle with wings) that the aircraft is currently on the path to crest the bridge mere feet above its upper deck. Imagine a driver leisurely driving to work when in a flash a gnarly old F-4 pops up out of a slot canyon, leaps over a bridge in front of him with mere feet to spare, and plunges back down again out of site. Could there be anything more awesome? Then again this intrepid F-4 driver could opt to take the "low route" below the bridge the moment after this shot was captured. In which case the aforementioned driver would probably see nothing, although that canyon he is driving over, filled with the earsplitting thunder of twin afterburning J-79s, would sound like it just awoke and is about to swallow him up. Photo & video credit: brave Hellenic Air Force Phantom Drivers & Weapon Systems Officers!